Written with practitioners in mind, this is an ideal self-study guide for not only statisticians, but also scientists, researchers, and professionals in the pharmaceutical industry, contract research organizations (CROs), and regulatory bodies. It's also a go-to reference for biostatisticians, pharmacokinetic specialists, and principal investigators involved in clinical trials. The license for the ExpDesign Studio software on the CD included with this book is good for one-year after installation of the software. Prior to the expiration of this period, the software will generate a reminder about renewal for the license. The user should contact CTriSoft International (the owners of ExpDesign Studio) at www.CTriSoft.net or by email at license@ctrisoft.net, about renewal for the license. This should have been made clear in the first printing of this book. We apologize for this error. Mark Chang, PHD, is a Scientific Fellow at Millennium Pharmaceuticals. He has extensive experience with IND and NDA submissions. His involvement in drug development includes both strategic and methodological aspects. Dr. Chang is an Associate Editor for the Journal of Biopharmaceutical Statistics. 1.2 How to Design a Trial Using ExpDesign Studio. 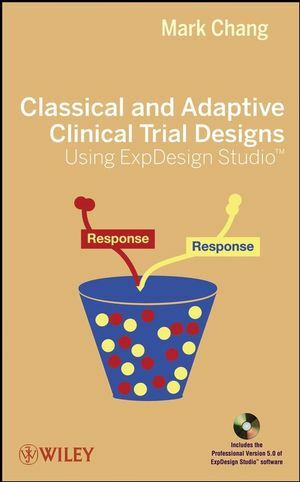 1.2.1 How to Design a Classical Trial. 1.2.2 How to Design a Group Sequential Trial. 1.2.3 How to Design an Adaptive Trial. 1.2.4 How to Run Adaptive Trial Simulations. 1.2.5 How to Design a Multistage Trial. 1.2.6 How to Design a Dose-Escalation Trial. 2.2 Classical Clinical Trial Design. 2.2.6 Trials to Show Superiority. 2.2.7 Trials to Show Equivalence or Noninferiority. 2.2.8 Trials to Show a Dose–Response Relationship. 2.3 Selection of a Trial Design. 2.3.1 Balanced Versus Unbalanced Designs. 2.3.2 Crossover Versus Parallel Designs. 2.3.3 Dose Escalation Versus Titration Designs. 2.3.4 Bioavailability Versus Bioequivalence Designs. 2.4 Adaptive Clinical Trial Design. 2.4.7 Multistage Design of Single-Arm Trials. 3.1.2 Importance of Sample-Size Calculation. 3.1.3 Factors Affecting Sample Size. 3.1.4 Avoiding Under- or Overpowered Designs. 3.2 How to Calculate Sample Size Using ExpDesign. 3.2.1 Testing the Mean Difference Between Two Groups. 3.2.2 Testing the Proportion Difference Between Two Groups. 3.2.3 Testing the Survival Difference Between Two Groups. 3.2.4 Testing the Survival Difference with a Follow-up Period. 3.2.5 Exact Test for a One-Sample Proportion. 3.2.6 McNemar’s Test for Paired Data. 3.2.7 Noninferiority Test for Two Means. 3.2.8 Bioequivalence Test for Two Means. 3.2.9 Bioequivalence Test for Two Means of Lognormal Data. 3.2.10 Equivalence Test Based on the Ratio of Two Means. 3.2.11 Precision Method for the Mean Difference for a Paired Sample. 3.2.12 Mantel–Haenszel Test for an Odds Ratio with Two Strata. 3.2.13 Pearson’s Chi-Square Test for Rate Difference. 3.2.14 One-Way ANOVA for Parallel Groups. 3.2.15 Dose–Response Trial for a Myocardial Infarction. 3.3 Mathematical Notes on Classical Design. 3.3.1 Large-Sample-Size Calculation for Classical Design. 3.3.2 Commonly Used Terms and Their Mathematical Expressions. 3.3.3 Relationship Between Enrollment Rate and Number of Events. 4 Group Sequential Trial Design. 4.2 Basics of Group Sequential Design. 4.3 How to Design Sequential Trials Using ExpDesign. 4.3.1 Design Featuring Early Efficacy Stopping for Two Means. 4.3.2 Design Featuring Early Futility Stopping for a Proportion. 4.3.3 Design Featuring Early Stopping for a Survival Endpoint. 4.3.4 Design Featuring Early Stopping for Paired Proportions. 4.4 How to Monitor a Group Sequential Trial Using ExpDesign. 4.4.1 Need for Trial Monitoring. 4.4.2 Techniques for Monitoring a Sequential Trial. 4.4.3 How to Monitor a Trial Using ExpDesign. 4.5 Mathematical Notes on Sequential Trial Design. 4.5.1 Unified Formulation for Sequential Trial Design. 4.5.2 Calculation of Conditional Probability. 4.5.3 Conditional and Predictive Power and RCI for Trial Monitoring. 5.2 Basics of Adaptive Design Methods. 5.3 How To Design a Sample-Size Reestimation Trial Using ExpDesign. 5.3.1 Sample-Size Adjustment Based on the Effect-Size Ratio. 5.3.2 Sample-Size Adjustment Based on Conditional Power. 5.3.3 Adaptive Design for an Acute Ischemic Stroke Trial. 5.3.4 Adaptive Design for an Asthma Study. 5.3.5 Adaptive Design for an Oncology Trial. 5.3.6 Noninferiority Design with a Binary Endpoint. 5.4 How to Design a Drop-Loser Trial Using ExpDesign. 5.4.2 Seamless Design of an Asthma Trial. 5.5 How to Design a Trial Using a Classifier Biomarker. 5.6 How to Design a Play-the-Winner Trail Using ExpDesign. 5.6.2 Adaptive Randomization with a Normal Endpoint. 6.3 How to Recalculate Stopping Boundaries Using ExpDesign. 6.4 Conditional Power and the Futility Index. 6.5 How to Reestimate Sample Size Using ExpDesign. 6.5.1 Calculating Conditional Power Using ExpDesign. 6.5.2 Reestimating Sample Size Using ExpDesign. 6.6.1 Changes in Number and Timing of the Analyses. 6.6.2 Recursive Two-Stage Adaptive Design. 6.6.3 Conditional Power and Sample-Size Reestimation. 7 Oncology Adaptive Trial Design. 7.1.2 How to Design a Multistage Design Using ExpDesign. 7.2.2 Bayesian Continual Reassessment Method. 7.2.3 How to Design a Dose-Escalation Trial Using ExpDesign. 7.3 Dose-Escalation Trial Monitoring Using CRM. 7.4 Mathematical Notes on Multistage Design. 7.4.1 Decision Tree for a Multistage Trial. 7.5 Mathematical Notes on the CRM. 7.5.1 Probability Model for Dose–Response. 7.5.2 Prior Distribution of a Parameter. 7.5.4 Reassessment of a Parameter. 7.5.5 Assignment of the Next Patient. 8.1 Adjusting the Critical Region Method. 8.2 Classical Design with Two Parallel Treatment Groups. 8.3 Flexible Design with Sample-Size Reestimation. 8.4 Design with Random-Play-the-Winner Randomization. 8.5 Group Sequential Design with One Interim Analysis. 8.6 Design Permitting Early Stopping and Sample-Size Reestimation. 8.7 Classical Design with Multiple Treatment Groups. 8.8 Multigroup Trial with Response-Adaptive Randomization. 8.9 Adaptive Design Featuring Dropping Losers. 8.11 Dose-Escalation Design for an Oncology Trial. 9 Further Assistance from ExpDesign Studio. 9.2 Virtual Trial Data Generation Using ExpDesign Randomizor. 9.2.1 Random Number Generation Using ExpDesign. 9.2.2 How to Generate a Random Univariate Using ExpDesign. 9.2.3 How to Generate a Random Multivariate Using ExpDesign. 9.2.4 How to Generate a Random Multibinomial Using ExpDesign. 10 Classical Design Method Reference. 10.1.1 One/Paired-Sample Hypothesis Test for the Mean. 10.1.2 One/Paired-Sample Hypothesis Test for the Proportion. 10.1.3 One/Paired-Sample Hypothesis Test for Others. 10.1.4 Paired-Sample Equivalence Test for the Mean. 10.1.5 Paired-Sample Equivalence Test for the Proportion. 10.1.6 One-Sample Confidence Interval for the Mean. 10.1.7 One-Sample Confidence Interval for the Proportion. 10.1.8 One-Sample Confidence Interval for Others. 10.2.1 Two-Sample Hypothesis Test for the Mean. 10.2.2 Two-Sample Hypothesis Test for the Proportion. 10.2.3 Two-Sample Hypothesis Test for Others. 10.2.4 Two-Sample Equivalence/Noninferiority Test for the Mean. 10.2.5 Two-Sample Equivalence/Noninferiority Test for the Proportion. 10.2.6 Two-Sample Equivalence/Noninferiority Test for Survival. 10.2.7 Two-Sample Confidence Interval for the Mean. 10.2.8 Two-Sample Confidence Interval for the Proportion. 10.3.1 Multisample Hypothesis Test for the Mean. 10.3.2 Multisample Hypothesis Test for the Proportion. 10.3.3 Multisample Hypothesis Test for Others. 10.3.4 Multisample Confidence Interval for Others. Appendix A: Validation of ExpDesign Studio. A.1 Validation Process for ExpDesign Studio. A.1.3 Criteria for Passing Validation. A.1.4 Input and GUI Validation. A.2 Validation of the Classical Design Module. A.3 Validation of the Group Sequential Design Module. A.3.1 Stopping Boundary and Type I Error Rate Validation. A.3.2 Power and Sample-Size Validation. A.4 Validation of the Adaptive Design Module. A.4.1 Stopping Boundary and Type I Error Rate Validation. A.4.2 Validation of Adaptive Design Monitoring. A.5 Validation of the Multistage Design Module. A.6 Validation of the Traditional Dose-Escalation Design Module. A.6.1 Validation of the Traditional Escalation Rule. A.6.2 Validation of the Bayesian Continual Reassessment Method. A.7 Validation of the Trial Simulation Module. A.8 Validation of the Randomizor. A.9 Validation of the ExpDesign Toolkits. A.10 Computer Programs for Validations. A.10.1 SAS Macro for Three-Stage Design Validation. A.10.2 Traditional 3 + 3 Escalation Design Validation. A.10.3 SAS Program for CRM Validation. Appendix B: Sample-Size Calculation Methods: Classical Design. System Requirements, Software Installation, and Software License Agreement.